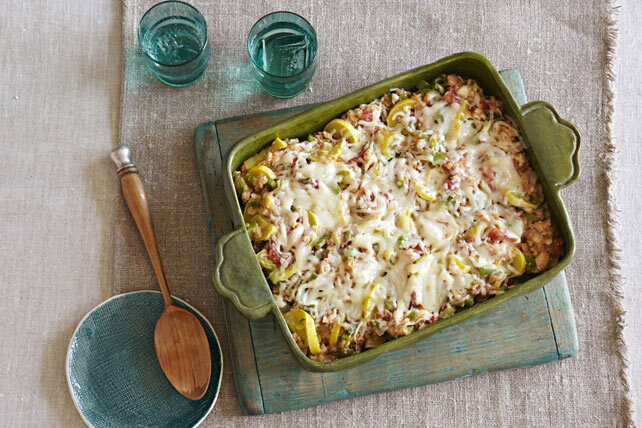 How is this cheesy stuffing bake a Healthy Living recipe? Well, the ratatouille part—including yellow squash, tomatoes and peppers—certainly helps! Heat oil in large skillet on medium-high heat. Add squash, peppers and onions; cook and stir 5 min. or until crisp-tender. Stir in garlic; cook 1 min. Add tomatoes and basil; cook 2 min. or until heated through, stirring occasionally. Stir in stuffing mix; spoon into 13x9-inch baking dish sprayed with cooking spray. Top with cheese; cover. Bake 35 min. or until heated through, uncovering for the last 5 min. Substitute yellow peppers for the green peppers, and/or zucchini for the yellow squash.